What makes Fisher Paykel unique in the appliance industry? We are the only global manufacturer that designs and engineers products in New Zealand – this is not only a competitive differentiator but our design advantage as well. Our full breadth of kitchen products offer designers and consumers the choice from Contemporary, Classic, Professional and Integrated designs with world class innovation. What are some design/innovation trends you are excited about? 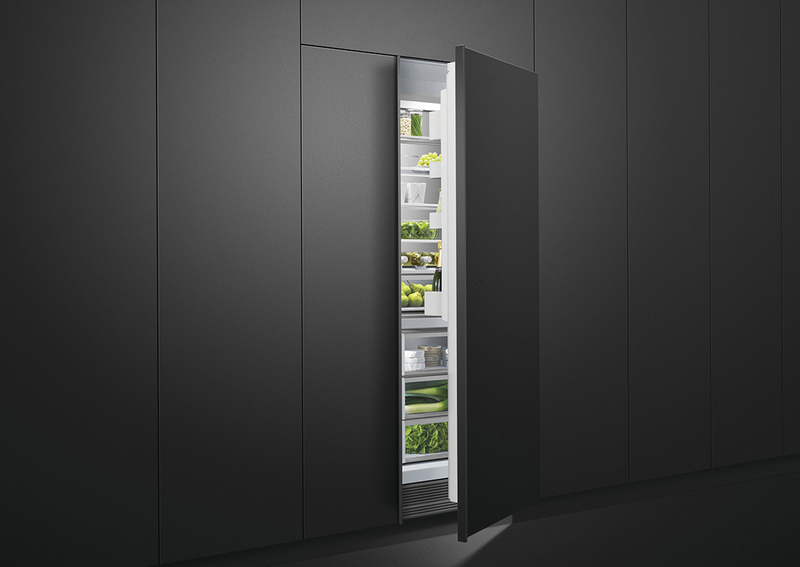 Fisher & Paykel have been leading the world in appliance innovations since the early 1980s. Products like the DishDrawer™ Dishwasher and the CoolDrawer™ Multi-temperature Refrigeration Drawer have not only pioneered new, compact technologies, but have changed appliance design forever. But it is what is on the inside – our SmartDrive™ motors and ActiveSmart™ Foodcare refrigeration technology that really differentiates us as a company of creativity. Cooking – our focus is on over-delivering on expectation with our cooking portfolio. Innovation through maximizing capacity, evenness of temperature, a clean and seamless interface and smart functionality such as a unique roast function. How does F/P design products around specific lifestyle needs? We are curious about people. How they live, where they live, what they do and how they use things. This is where hidden insights wait to be uncovered. We are curious not only with the function and performance of our products but with the emotional role they play in people’s lives. For us, design is not a self-serving goal; it is a human endeavor to make life better. Continuous innovation is part of the Fisher & Paykel design philosophy. Innovation comes from curiosity. By understanding our customers – the way people use kitchens and appliances, how they cook and eat – we have discovered insights that have made us rethink how to design appliances. We also know that we need to think about the entire context of the appliance. We study trends and developments in the house and kitchen design as a whole so that our appliances fit into and respond to the changing environment of the modern kitchen. As a premium brand, the quality of the details in our appliance is significant. From using high quality metals and glass to the careful weighting of a dial, we focus on creating a tactile sense of premium cues at every touchpoint. What’s your company view on sustainability? The company is committed to ongoing research and development with a culture of open innovation, which allows people to work collaboratively to find insights and ideas that connect with customers and respect the planet. The products that we design and manufacture will always be cornerstones within our sustainability approach. However, reducing the impact on the environment goes far beyond making more efficient products. Fisher & Paykel has been committed to environmentally responsible processes, right across its operations, long before the words sustainability and global warming became commonplace. In addition to the development of efficient technologies, sustainable manufacturing is key. We’re interested in more than just a sticker on a product; we have committed ourselves to consider the environment in every step of a product’s life cycle. Our designers avoid construction techniques that combine incompatible materials in a way that cannot be easily separated for recycling and we also put identification marks (to International Standards) on plastic moldings showing which raw materials they are made of. The company’s philosophy is not only evident in its end products, but is carried through all aspects of the organization. Are there any awards you’re especially proud of? We have won a number of prestigious international awards recognizing our passion and commitment to design. Most recently in North America, Fisher & Paykel’s DishDrawer™ dishwasher was the popular choice winner in the Architizer A+ Awards. This is an annual program focused on promoting and celebrating the best architecture and products as well as the 2017 Platinum a’ Design award for DishDrawer and the 2017 Architectural Digest Great Design Award for the Pyramid Ventilation Hood. For the last three years we have received the Kbculture Award for 2016, 2017,2018.